Today, we are talking about cat eyes. You know what I mean. That amazing flick just past the outer edges of the eyes that manages to lengthen, sexify and basically enhance those pretty peepers. Sounds awesome, right? There’s something else you should know. The cat eye also helped ushered the post-war peace all around the world, and remains an indomitable classic. 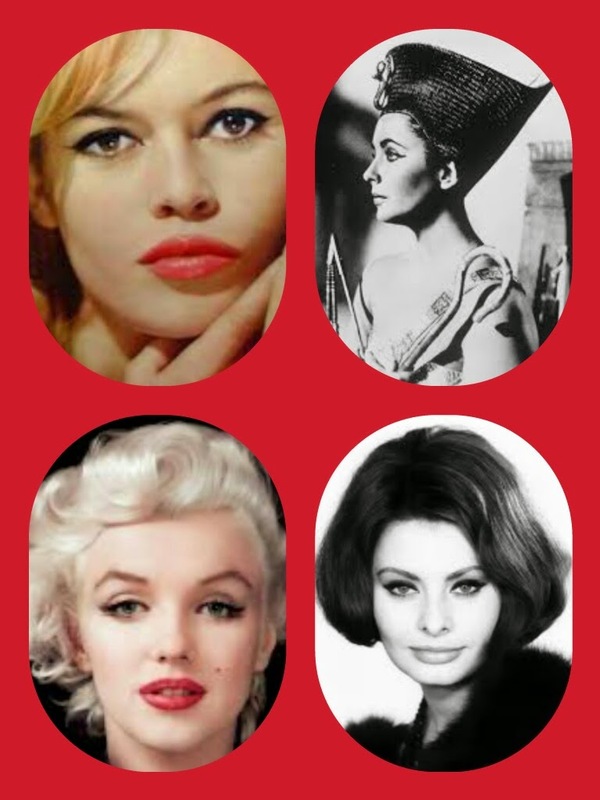 WW II ended in 1945, and the cat eye truly bloomed in the 1950s. Some might argue that it truly began in the 1940s, but since it was during this period that WW II ended, their makeup was minimal at best (if you count red lips minimal, that is), and the flick at the end of the thin liner is at best called flicked liner. In this post, cat eyes are defined as a visible line across the lid (not counting lash and water line), with or without extending the eye, and ending with a clearly visible flick across the outer edge of the eye. I’m talking about classic, daily, wearable cat eyes here. If you guys want me to do an OTT cat eye style article, leave comments below, subscribe, and I will deliver. These are all the classic icons everyone should get to know. Brigitte Bardot with her baby cat eye, basically defined liner with either a thin long flick, or a small point just outside of the lash and eye line, as shown above. It’s easy to replicate, because the flick is very small and does not require as much of a steady hand. Elizabeth Taylor with both her signature cat eye and all the outrageously seductive eye looks in Cleopatra (which, although was a complete bust in its time, served to catapult Elizabeth into the stratosphere of number of cat eyes in a film). Marilyn Monroe with her elongating pinup cat eye. White eyeshadow to brighten the lid, taupe-brown contoured crease and a thin elongating flick that gave her eyes the iconic sleepy look. She’s often considered the 50s bombshell, as she lived and died in the same era. Finally, the ever inspiring Sophia Loren, with a cat eye that widened, lengthened and enhanced her already beautiful round eyes. For her, she added an extra white triangle along the outer corner to give her round eyes more of an almond shape, which is easier to sexify. They really pioneered the art and styles of cat eyes. In the makeup world, every single one of these icons’ looks have been highly coveted, copied, reimagined and treasured. They are classics, because their makeup not only fits them, but they also fit anyone else who tries them. Personally, I haven’t tried the Sophia Loren look yet, but it on the list. And here are the present day reinterpretations of cat eyes. There’s Lee Hyori, who I love for constantly pushing the boundaries of pretty. This picture is the one emblazoned across the world-reknowned Clio Kill Black Waterproof Liner, Clio Gel Liner and more. In Korea, they are calling these liners ‘Lee Hyori-liner’. I absolutely adore the cat eye here – I’ve even worn it a few times, in greens and blues. Have to try the black. Stana Katic, whom as Kate Beckett served up weekly flawless classic liner. Hers is closer to the classic pinup cat eye – contoured lids and a thick, defined flick – and the Bardot cat eye – a thin, short flick outwards rather than up. Kate (the character) is also a cop, so the cat eye is pretty restrained. Look to her for work-appropriate makeup. Who can forget Alexa Chung? With an eyeliner created by her and the line helmed by the current Cat Eye Queen, she is every girl’s cat eye dream. It always looks perfect, and can easily be adopted from day-appropriate to night. But, according to her, it doesn’t always come out that perfect. She uses Q-Tips (cotton buds for everyone not from US) to clean up any mistakes. Finally, my brow idol, Lily Collins. She wore this look to the 2013 Vanity Fair Oscar Party. Despite it being a night look, I believe anyone can copy it. Whether you use tape, cards or just clean up with Q-Tips, this cat eye is sultry and sweet at the same time. She’s not as well known for the cat eye as the other ladies here, but that’s because she is still trying out different styles before setting for a signature. I know the title says ‘My Favourites’. Unfortunately, after I finished writing the whole earlier part of the article, I realised that I love all of the looks I have picked to show here. Whether it is sweet, sultry, simple or difficult, I love all of them. But, guns to my head, I would wear either the Bardot, the Hyori and the Elizabeth for the rest of my life. I mean, come on, who can really live with just one? If there’s anything here that you would like me to show you, please just comment below. I would love for you to like this and subscribe to me. If not, I hope that you have as much fun reading this as I have writing this.